On April 13, the Wisconsin Supreme Court voted unanimously to adopt a change proposed by the Access to Justice Commission that will result in a new source of funds for civil legal aid to the indigent in Wisconsin. The court acted following a public hearing on Petition 15-06, which was filed by the Access to Justice Commission. The rule change will direct at least 50% of unclaimed funds in state class action settlements and awards to the Wisconsin Trust Account Foundation to support civil legal services. On the same day, the court also approved Petition 15-05, which was filed by the State Bar of Wisconsin, to allow lawyers to claim CLE credit for pro bono work. Registered in-house counsel will also have broader authority to do pro bono work. CLE credit for pro bono can be earned at the rate of 1 CLE credit for every 5 hours of pro bono legal services up to a maximum of 6 credits per reporting period. Attorneys will need to perform their pro bono work through a “qualified pro bono program” in order to claim the pro bono CLE credits. The court is expected to issue final orders on the two petitions in the coming months. When the final order on Petition 15-06 is issued, Wisconsin will become one of at least 16 states that have amended their rules of civil procedure to provide for what is sometimes called a cy pres rule to support civil legal services. Speakers at the hearing noted that the petition has broad support, including from the State Bar of Wisconsin, the plaintiff’s bar, the defense bar and many judges. Concerns about limiting judicial discretion were raised by the Committee of Chief Judges but several speakers noted that trial courts would retain discretion over the remaining 50% of any unclaimed class action residual funds. Jim Gramling, President of the Access to Justice Commission, urged the court to consider and give greater weight to its broader responsibility towards access to justice in the legal system as a whole, something that is best served by the Commission’s proposal. Speaking in support of the petition, attorney Kevin Palmersheim, a member of the WisTAF board pointed out that WisTAF has deep knowledge of the legal needs served by their grantees and has experience distributing state appropriations and private settlement funds to legal services grantees statewide. It was noted at the hearing that the current lack of guidance allows counsel for the class and the trial court to decide who will receive any leftover funds, which can lead to groups lobbying lawyers and judges. The new rule will create more structure around state class action settlements. It will also serve as a model for federal courts, where most class actions are filed. The Supreme Court’s decision comes on the heels of a recent access to justice resolution from the Conference of Chief Justices and the Conference of State Court Administrators. 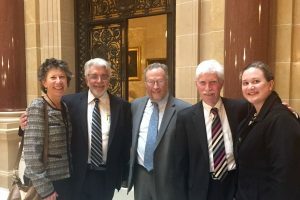 The resolution urged courts to work with their access to justice commissions towards an “aspirational goal of 100 percent access to effective assistance for essential civil legal needs.” This latest decision on cy pres is part of a recent string of decisions from the Wisconsin Supreme Court that support access to justice in Wisconsin. Allowing Wisconsin lawyers to claim CLE credit for providing pro bono legal services is the latest in a series of efforts to turbocharge pro bono in Wisconsin. The need is great. Lawyers, judges and the public agree on that. There is too little funding for the staffed civil legal services programs around the state and there are too many people who are forced to go it alone when they face serious legal challenges in their lives. With the Wisconsin Supreme Court’s approval of the CLE credit for pro bono rule, Wisconsin will join 11 other states that have adopted similar provisions. The change recognizes the importance of pro bono service as a professional obligation, as an access to justice strategy, and as a source of experiential learning.